Situated within 1.8 km of Dinevi Marina and 5 km of Sunny Beach Central Beach in Sveti Vlas, Rodina 2 Apartment features accommodation with free WiFi and flat-screen TV. Each unit comes with air-conditioned bedrooms and a kitchen with a microwave. A terrace with city views is offered in every unit. The apartment offers an outdoor pool. 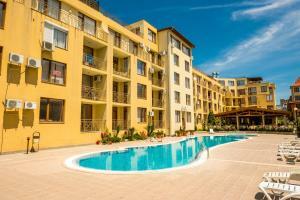 The nearest airport is Burgas Airport, 31 km from the property. When would you like to stay at Rodina 2 Apartment ? This apartment features a stovetop, kitchenware and balcony. A security deposit of EUR 25 is required upon arrival for incidentals. This deposit is fully refundable upon check-out and subject to a damage inspection of the accommodation. Payment before arrival via bank transfer is required. The property will contact you after you book to provide instructions. Please inform Rodina 2 Apartment in advance of your expected arrival time. You can use the Special Requests box when booking, or contact the property directly with the contact details provided in your confirmation. Each day we'll check prices and send you an email for your selected dates at Rodina 2 Apartment. If you don't have specific dates but would like to check prices for say next weekend or say next month we can check the price too. 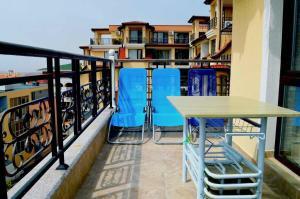 Click to write a review and share your experience of Rodina 2 Apartment with other travellers.